New UGENE workflows for metagenomics presented at BGRS’2018 | Unipro. Reliability. Quality. Intellect. New UGENE workflows for metagenomics presented at BGRS’2018 – Unipro. Reliability. Quality. Intellect. UGENE team is a regular participant of BGRS conference at Novosibirsk. 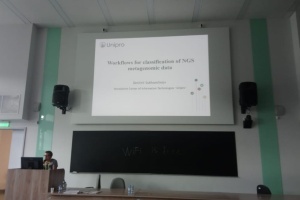 This time new workflows for effective classification of metagenomics whole-genome NGS data were highlighted in presentation of Unipro engineer Dmitry Sukhomlinov. Several instruments and relevant databases were integrated into UGENE software upon collaboration with VIROGENESIS project. This resulted in new computational infrastructure for the taxonomy classification of whole-genome shotgun sequencing data. Reference data are also provided: NCBI taxonomy information; RefSeq data for viruses, bacteria, human; etc. New computational pipelines enable both serial and parallel data processing. The researchers need only to specify their input NGS data and output data location to run the workflows and get the results. New workflows are available in UGENE 1.31 release. See the project download page.